I recently had a milestone birthday (I’m not saying which one) and when my husband asked me what I wanted as a gift, I didn’t ask for diamonds, an ocean cruise, or a new wardrobe…more than anything, I wanted a sewing room makeover! So I took myself off to IKEA to see what possibilities I could find. I wanted furniture that was beautiful, calming, and most of all, functional (plus reasonably affordable). What I had before was dark, and somewhat functional, but mostly a pieced together hodge-podge collected over the years. 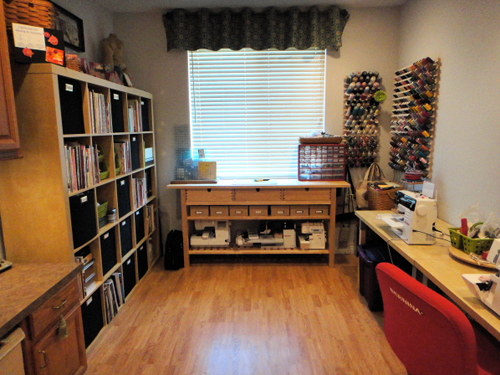 I have a fairly large work area (10′ x 20′) with an office in one end and a sewing space at the opposite end. I ended up selecting four pieces that, so far, seem to be exactly what I had in mind! I opted to go with tables rather than a sewing cabinet because I am often switching machines, moving them in and out, depending on what class I am teaching or what type of project I am working on. These two tables are about four feet long and right now I have them end-to-end along a wall. They are sturdy but fairly lightweight and easy to move so if I want an L-shape or need more support behind the needle for a large project, it will be simple to rearrange them. This 74” table is counter height and perfect for small cutting jobs and quick pressing steps. The three roomy drawers hold a large collection of stabilizers and interfacing. Best of all, I can put a few machines on the lower shelf to tuck them out of the way when it isn’t their turn to play. 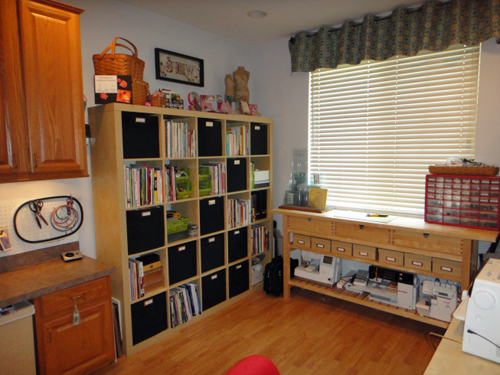 I used the upper shelf to sort and store items such as adhesives (fabric glue, glue sticks, craft glue, etc. ), laces & trims, and buttons. Of course, I labeled the boxes so I know exactly what’s in them and if I remember to put things back, it will stay that way! Being a visual person, I like having all of my tools, gadgets, books and notions out in the open so I can see them, making it easy to find them (sometimes), and using them for creative inspiration. The problem with having everything out in the open is that before long, clutter takes over and it’s hard to even think straight in the middle of it, let alone be creative. The answer to that dilemma for me is to have open cubbies (just like preschool…) so there is order and organization but everything is readily available. Some of the cubbies have labeled fabric boxes that hide the clutter but easily pull out to show off what’s in them. One of my favorite things about my new sewing room is the color of the furniture. It brightens up the entire space and feels modern but warm and cozy at the same time. I love how clean and organized it is and I have all kinds of ideas for projects I can create here. The real question is, “Can/will I keep it this way?” I’ll check in about six months from now and let you know…wish me luck! It looks wonderful. Can you tell us where you store your fabric? A couple of the fabric boxes in the wall unit hold fat quarters but most of my fabric is at the office end, stored in a floor to ceiling closet. My current yearlong goal is to use, gift, or donate a large portion of what I have because no matter what I have, it never seems to be what I need at the moment, hence, the closetful of fabric. My next challenge in this space is to figure out a better way to organize my stash. I’ve tried by color, fiber content, and amount but it still seems that I have to look through it all before I can make up my mind and by then it’s all one big pile again! I was trying to find the table below the windows with the drawers and storage. While the link leads me to the catalog, I don’t see this table. Do you remember the name of it? Your room looks awesome. Crazy jealous here. Enjoy! I love your new room especially the table at the end of the room. Can you please tell me where you got the boxes for the upper shelf? Good luck staying organized! The boxes are just photo boxes purchased at Michaels on sale for less than $2 each – practical AND a bargain! 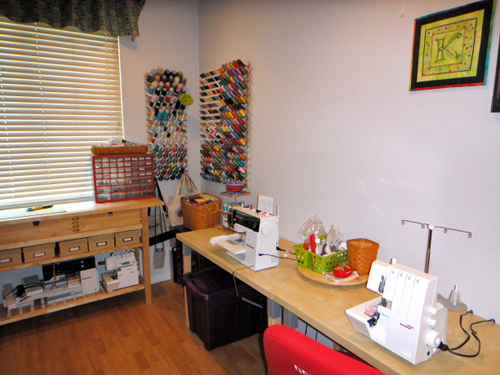 Love your sewing space Susan. Great ideas for using your space wisely! This is fabulous, Susan — I’ll bet you’re loving your new space! And happy birthday, by the way! I really like that table beneath the window as well — I have been looking for something like that to put an ironing board top on. The folding ironing board I have now wastes all the space beneath it, has been knocked over by my dogs more than once (when they they look out the window and see see OTHER dogs being walked past our house and have to go racing out of the room in a barking frenzy), and the tapered end on my ironing board is no help ironing quilting yardage or pressing large quilt tops. I need to make a trip to Ikea! Susan, I love what you did. It looks awesome! I was wondering if your sewing machine vibrates when you sew in the IKEA table? I have tried a variety of tables in the past and found that to be the case. Do you know what would work to stop that?